The Lord of the Rings is back and it's bigger than ever. Weighing in at a whopping three hours and twenty minutes (plus ads and trailers of course) the question I find myself asking is not so much: will the Fellowship defeat the armies of Sauron? 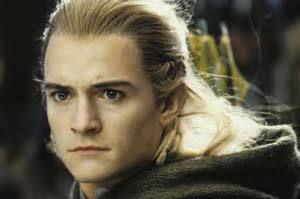 Will Frodo and Sam reach Mount Doom and destroy the Ring? Will Aragorn and Arwen ever get it on? But: can I last nearly four hours without needing the loo? Of course if you've read the book you'll know the answer to all the above questions (except the one about me needing the loo. although who knows what useless information is included in the pages of Appendices at the end of Tolkein's masterpiece?) So I suppose really the question I should ask is: how the hell is Peter Jackson going to pull it off? And the answer? Brilliantly. First up, the battles. 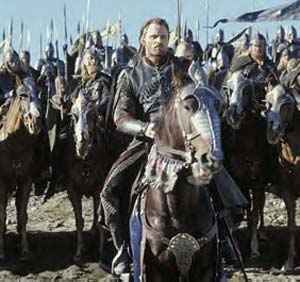 If you thought the battles were breathtaking in The Two Towers, all I can say is, you ain't seen nothing yet. Massed ranks of orcs, trolls, riders and, er, luminous green dead warriors swarm across the screen in dizzying numbers, yet when we zoom in on individuals, each is unique and personalised, from the manliest Gondorian warrior to the ugliest, meanest, stupidest troll (not of course forgetting the porcine orc leader who really does look as if he's been drafted in from Jackson's first cult classic, alien vomit-fest Bad Taste). Our Fellowship heroes are still on fine form, so expect swashbuckling action from Viggo and Orlando, much needed light relief in the form of comic one-liners from John Rhys-Davies' Gimli, plucky performances from Merry (Dominic Monaghan) and Pippin (Billy Boyd), as they finally get to prove they're not such fools after all, and powerful Shakespearean gravitas from the ever-wonderful Sir Ian McKellan. and if he doesn't win himself an Oscar this time round I'll eat my woolly hat. Despite endless trailers and previews, Jackson still has some fantastic surprises in store, in the form of some truly weird and wonderful creatures. Very occasionally it does occur to you that you're not really watching a live action film at all but an immensely sophisticated computer generated cartoon (I very much doubt that the real Orlando Bloom appears at all in Legolas' big scene when he brings down an Oliphant), but most of the time, to be honest, the mechanics of the film don't cross your mind as you thrill to the fast-paced, edge-of-seat action. 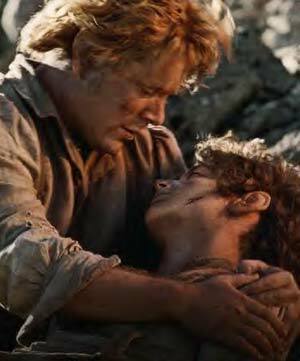 In between the fighting, however, we have the emotion, mostly courtesy of our gallant hobbit heroes, Frodo and Sam, who struggle through Mordor getting dirtier and dirtier and more and more glassy-eyed and tearful as their journey progresses. As Frodo (Elijah Wood), fights the insidious power of the Ring, bug-eyed, gasping and increasingly spaced out, Sam (Sean Astin) is finally allowed to come into his own. If Fellowship was Elijah Wood's film and The Two Towers Viggo Mortensen's, then Return of the King (somewhat ironically, given the title) belongs to tubby Sean, who puts heart and soul into a performance that is noble, dignified and utterly moving. 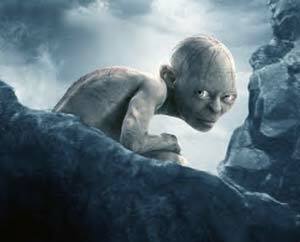 Andy Serkis repeats his Oscar-worthy turn as the twisted creature Gollum and even gets to put in an appearance in person in a flashback scene, whilst arachnophobics should beware of the long-awaited Shelob scene. Watch out, Mr Frodo, she's behind you. So what about the mushy love stuff then? Well, sadly the romance between Eowyn and Faramir is elbowed aside to make room for more misty-eyed Liv Tyler action, which seems a shame given Miranda Otto's gutsy bravado on the battlefield - the fear in her eyes as she faces the enemy is palpable and seems utterly real - surely the poor girl deserves to get her man? Critics and audiences alike have complained that the 'happy' ending goes on too long and perhaps it does, but it's also very necessary. Victory on the battlefield is never the end of a story (just ask the people of Iraq) and the hobbits' attempts to return to normality back in the Shire is realistically and beautifully handled - watch out for the scene in the pub, it's a little gem. Tissues out for the final moment, however, which rivals ET for sentimentality. Sniff. My only gripe would be the absence of the wonderful Christopher Lee as Saruman, along with snivelling sidekick Grima Wurmtongue (Brad Dourif), which seems a terrible shame - I guess I'll just have to wait for the extended DVD version to witness their downfall. All in all, a towering achievement that makes the Star Wars trilogy look about as epic as an episode of Neighbours. So sit back with a bumper bucket of popcorn and prepared to be blown away.